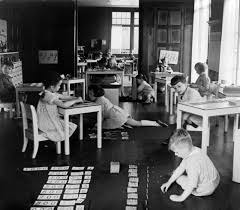 Home › Montessori › What is Montessori? The Montessori Method is first and foremost, a child-centered method of education based on scientific observations of children from birth through adulthood. With training in medicine, psychology and anthropology, as well as actual observations while working with children, Dr. Maria Montessori developed a philosophy of education that has had a profound impact for more than a century and has been time tested in diverse cultures world-wide. This Method, aimed at developing the whole child—physically, socially, emotionally and cognitively—is based on optimizing learning for a child’s individual growth. The Montessori environment is carefully designed to suit the stages of development, drawing inspiration from nature, while maintaining a sense of beauty, structure and order. The direct result is a space that encourages the naturally eager spirit of the child, one that supports and values the individual, encourages independence, freedom with limits, and a sense of order. Children learn in mixed-age classes and make use of what the environment offers through individual choice. Thus, the teacher, the child and the environment play important roles in the learning process; providing for appropriate lessons and experiences to match an individual’s ‘sensitive period’, a period in which learning is most naturally absorbed and internalized by the child. Early years are marked by cognitive development using sensory-motor activities that provide direct experience. Over time, concrete materials give way to more abstract activities as the elementary child continues to advance his knowledge, learning to think critically, creatively, and collaboratively.